On this occasion, the Assistant United States Attorney boldly moves (where no AUSA has moved before) to postpone a trial because an agent of the Bureau of Alcohol, Tobacco, Firearms, and Explosives, has pre-paid the cost of visiting the zone of “totality” of a solar eclipse that will occur on August 21 (about the eclipse, the motion oddly uses the phrase “scheduled to occur,” as if someone arbitrarily set the eclipse, as an impresario sets a performer, to appear at a chosen time and place, subject always to some unstated exigency). Cruel fate has dictated that the August 21 eclipse will occur during the trial of an action in which the agent is a principal participant on behalf of the United States. 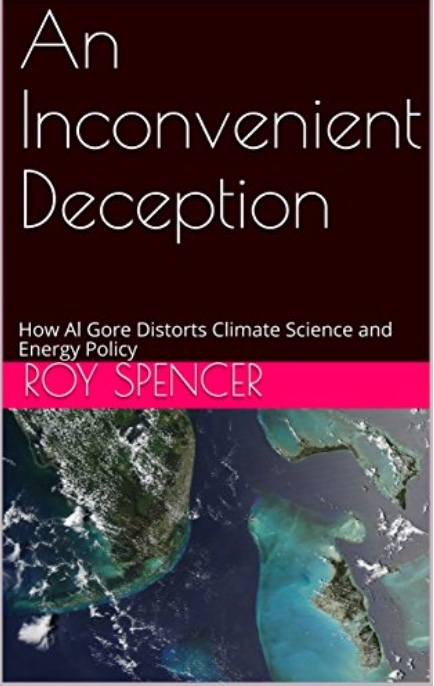 Ten years ago, after An Inconvenient Truth appeared, I produced by own 48-minute video lecture on what’s wrong with Al Gore’s account of the whole matter, which I called An Inconvenient Truth—Or Convenient Fiction? (It’s still up on YouTube, along with a short update I did one year later, but both are way out of date now, so I don’t especially recommend them.) I just haven’t got it in me to suffer through Gore’s new sequel (and apparently not many other moviegoers can either), and so I’m not going to produce another rebuttal video. I am not a global warming “denier” as is often alleged, nor am I opposed to alternative (non-fossil) forms of energy per se. What I am opposed to is misleading people with false climate science claims and alarming them into diverting vast sums of the public’s wealth into expensive energy schemes, this creating energy poverty and reducing our standard of living. When such policies are followed, it is the poor who suffer the most. . .
Wind and solar power remain expensive, and so governments’ mandating their use as a way to reduce carbon dioxide emissions will make their citizens poorer and more vulnerable to real threats. I admit that there is at least the possibility that humanity could suffer some harm from our greenhouse gas emissions. But I also believe that the benefits of more CO2 in the atmosphere will outweigh any harm. Published research demonstrates the Earth is undergoing global greening and increased agricultural productivity due to the fertilization effects of more CO2. As I say, worth buying and reading the whole thing. Appearing at the Minnesota State Fair yesterday and sitting for an interview with Minnesota Public Radio, Klobuchar was asked about the Stras nomination. The interview generated an AP story by Kyle Potter (posted at the link along with the audio of Klobuchar’s NPR interview) that also made it into the Star Tribune. The editors of the Star Tribune editorial page do not encourage op-ed columns that break the local news the Star Tribune itself hasn’t gotten around to reporting. Today, however, they let Third District Rep. Erik Paulsen report that Klobuchar and Franken have in fact blocked the Senate from taking up Stras’s nomination. Rep. Paulsen tells the story in “Klobuchar, Franken impede the path of an outstanding judge.” It’s a good and even important column on the merits of the Stars nomination. Please read it all. Who knew? For many many decades, the Educational Establishment had been absolutely consumed with the “gap” in educational achievement between students “of color” and students of extreme Nazi whiteness. And, of course, Asians, who are counted as “even worse than white” when it comes to curve-wrecking academics. Some right-wing racists believed the gap had had something to do with studying more, fewer hours spent watching television, turning in homework, that sort of thing. But they were sent to re-education camps and eventually were rehabilitated. The North Korean Get-Your-Mind-Right Diet Plan of 700 calories a day probably helped in focusing their attentions away from Wrong-Think. Other outlawed Christian lunatics had noticed that there was a strong correlation between having a father in the home and the academic achievement and discipline of his children. The rations of such lunatics were reduced to 500 calories a day (2 yogurts, arugula, and a Fig Newton) until they came around. So you can imagine their shock and dismay when these backward elements learned the truth: it was the presence of statues that had prevented black children from learning! The minute the offending statues came down, their SAT scores rocketed up, and the offending gap was erased. Or scores definitely WOULD have rocketed up if both letter grades and the racist, sexist, tests had still been allowed. Everyone who was not Irredeemable was certain that the gap was gone for good. Nobody wondered aloud why The Lightbringer had had eight endless years to get rid of the statues and had not. And nobody mentioned either that not one in ten students of any color knew who most of the offensive historical figures even were. At the time that the statues started coming down, 74% of all high school students identified “Andrew Jackson” as the 7th Jackson brother, the one that came between Jackie and Tito, and, sadly, the only one who couldn’t sing. “Thomas Jefferson” was described as “that President before Obama who slept with a slave or something” by 58% of students and “The guy who invented the telephone?” by another 25%. “Jefferson Davis” was believed by 48% of high school graduates to be “the real name of Snoop Dogg” and nobody even hazarded a guess about Nathan Bedford Forrest, except “a white guy who was bad?” (which turned out to be right, actually, proving once again that even a blind pig finds an acorn now and then). The sculpture of Crazy Horse, 17 miles from Mount Rushmore, a work in progress since 1948, was also dynamited. A few Native Americans complained, but they were overruled due to strong lobbies of crazy people who objected to being called crazy, and others objecting to the cultural appropriation of our equine companions. The Museum of Science and Industry in Jackson Park in Chicago was offensive on so many levels that it was almost razed except for a last-minute reprieve by Mayor Lena Dunham, who had won re-election of the city of 2.7 million souls by over 5 million votes. She had lurked in airports reporting conversations she had heard and turned over her vast notes to the Perpetual Mueller Commission until she was elected to her first term just to get her out of airports. Mayor Dunham – who often pranced about naked at her press conferences, reliving her Glory Days on Girls – convinced the public that Jackson Park was named for Jesse Jackson, Jr. who had set a national record for collecting disability. The Science Museum would be repurposed as a place to study Global Warming and other science-y things as soon as the Blizzards of ’25, ’26, and ’27 could be cleared enough to get to it. Nobody liked “Industry” either on a personal or corporate level and so that stupid, racist word was dropped. The oceans commenced to lowering and the unicorns scampered among the rainbows and all was right with the world after the great Statue Eradication Project of 2017. Hillary Clinton’s books are said to induce nausea. My advice? Skip the books; read the reviews. Especially if they are written by Steve, or by P.J. O’Rourke. There, I’ve spared you from reading the worst book to come out of the Clinton administration since- let’s be fair-the last one. Nearly everything about It Takes a Village is objectionable, from the title to the acknowledgments page, where Mrs Clinton fails to acknowledge that some poor journalism professor named Barbara Feinman did a lot of the work. Mrs Clinton thereby unwisely violates the first rule of literary collaboration: blame the co-author. And let us avert our eyes from the Kim Il-Sung-type dust jacket photograph showing Mrs Clinton surrounded by joyous-youth-of-many-nations. Please overlook the fact that O’Rourke endorsed Clinton in 2016 and read the whole thing. Laughter is the best medicine. I also encourage you to read the entirety of O’Rourke’s 2003 review of Mrs. Clinton’s follow-up effort Living History, which also appeared in the Weekly Standard. I wrote about it here. If you plan not to read this summer, “Living History” is just the book. Hillary Clinton’s new memoir is more than 100,000 pages long. At least I think it is. There are only 562 page numbers, but you know how those Clintons lie. Conservatives, including most of the Founding Fathers, have always worried that the price of a democratic system would be a mediocre nation. But George Washington and William F. Buckley Jr. put together could not have foreseen, in their gloomiest moments, the rise of Clinton-style über-mediocrity–with its soaring commonplaces, its pumped trifling, its platinum-grade triviality. The Alpha-dork husband, the super-twerp wife, and the hyper-wonk vice president–together with all their mega-weenie water carriers, such as vicious pit gerbil George Stephanopoulos and Eastern diamondback rattleworm Sidney Blumenthal–spent eight years trying to make America nothing to brag about. They failed. And that is, ultimately, what makes “Living History” such a good nonread. If they’re going to throw the book at us, and the book is by Hillary, the republic will endure (and the Republicans will prevail). Fourteen years before the fact, O’Rourke thus correctly answered, perhaps now to his chagrin, the question that provides the title of Mrs. Clinton’s latest book. He explained what happened to Hillary Clinton last year.